Harrogate Town will be wishing that they could play live on television every week. The club's home debut in front of BT Sport cameras saw them deliver their best performance in some time as Hartlepool United were taught a footballing lesson at Wetherby Road. Goals early in each half from Lloyd Kerry and Jack Muldoon set Town on their way, and although the visitors pulled one back, an excellent Mark Beck header sealed a richly-deserved three points and a first win in six National League outings. 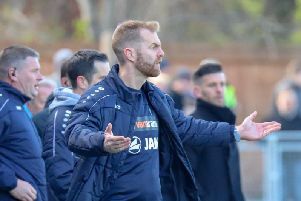 Boss Simon Weaver couldn't have asked for a better start to proceedings as his side got their noses in front with just four minutes on the clock. George Thomson attacked down the centre of the pitch and when the ball found its way into the penalty area Pools failed to clear their lines, allowing Kerry the opportunity to fire beyond Scott Loach from close range. Town continued at a blistering pace and, just seconds after the re-start, Josh Falkingham sent a long-range shot just wide from distance before Thomson was denied by a brave Michael Raynes block. Referee Marc Edwards then handed the hosts the chance to double their lead, pointing to the penalty spot having spotted a pull on the shirt of Beck. Thomson stepped up and drilled an effort towards the bottom left corner, though Loach was equal to the effort, getting down low and pulling off a brilliant save. After 26 minutes on the back foot, Pools eventually managed to construct an attack of note. Luke Molyneux crossed from the left for Nicke Kabamba, whose header towards the near post forced James Belshaw to spring to his right and push the ball to safety. And although it was Town who finished the half firmly in the ascendancy, United were the team who came closest to finding the game's second goal when Raynes nodded over Molyneux's dangerous right-wing free-kick. The second period began in similar fashion to the first, Weaver's men again striking an early blow. Thomson ran at the Pools defence and brought a decent parry out of Loach before the ball was recycled by Kerry into the path of Muldoon, who blasted home an unstoppable strike. The home team seemed to be absolutely cruising at this stage, however out of nowhere, United managed to pull a goal back in the 57th minute. Belshaw couldn't claim a looping cross from the left and Kabamba was on hand at the far post to fire in at the second attempt. That strike failed to spark the visitors into life, however, and Town's two-goal cushion was restored within 10 minutes. Muldoon did brilliantly to get down the left flank and to the byline where he delivered a cross for Beck to loop a fine header back the way it came and just under the cross-bar. The closing stages saw Harrogate looking the more likely with Kerry denied by some good work by Loach and substitute Aaron Williams cracking one just the wrong side of the post, though the result of the game was already well beyond any doubt.